There comes a time in everyone’s life when they get caught in a very heavy rain without an umbrella and get soaking wet. If you are forgetful like me, then those situations happen quite frequently. In such times, I’m very thankful to my waterproof and dry duffle bag for keeping my laptop dry. 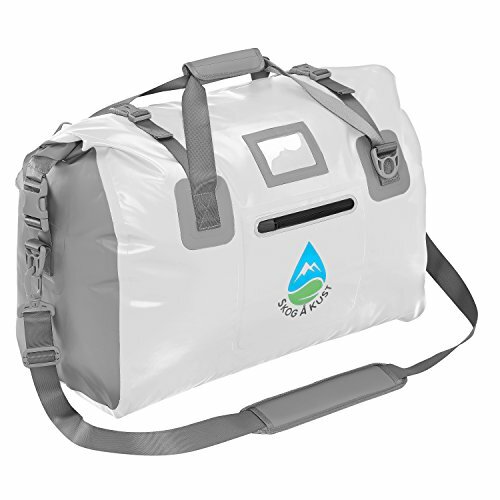 If you don’t own a waterproof duffle bag, then it’s time to get one! You will definitely use it on many occasions, and particularly for all activities that include water. And, you can also carry them to the beach, because they are a much better option. Why, you might be asking yourself? Well, if you want to get the answer, read the rest of this review of the best waterproof duffel bags! 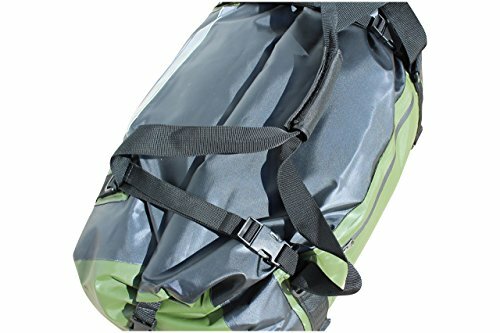 Why Do I Need A Waterproof Duffel Bag? Which GoPro Alternative Is The Best Choice For You? Waterproof duffel bags (waterproof being the key word here) will keep all of your items perfectly safe and dry even if you pour water on them. The only scenario in which they might let you down is if they get fully submerged in water, so try to avoid doing that. Particularly if your laptop is in the bag! 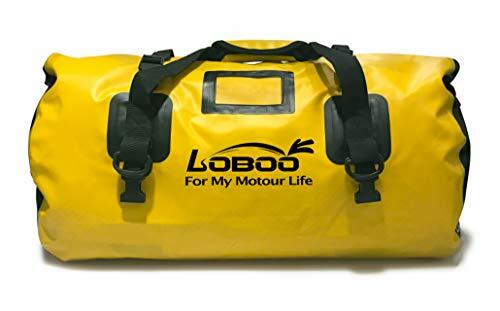 These bags are perfect for people who engage in a lot of wet-weather activities, such as kayaking, boating, skiing, snowing and even camping or hunting. You never know what kind of weather to expect, so if you are going to spend a lot of time outside, you will eventually need to get something waterproof. 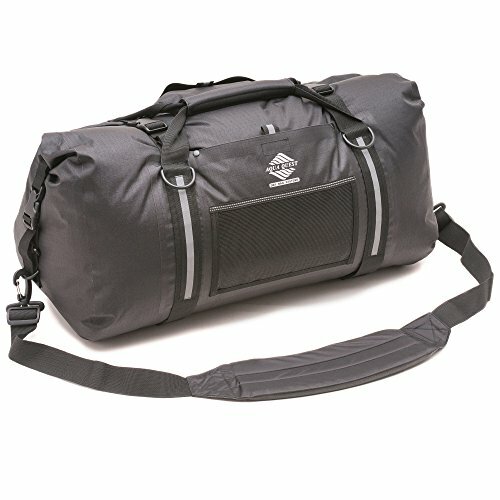 The duffel bag is made of 420D honeycomb polyester. This is a waterproof and sturdy material, so you can be sure that the bag will keep its contents dry no matter what. You can get it in 2 colors – green and pink. With an 80 L capacity, you’ll be able to carry anything you might need with you, whether you are going kayaking or camping. A big benefit of this particular bag is that it has several exterior pockets. You can put any items you would like to have handy (for example your phone or tablet), and all the pockets can be closed off with YKK zippers. 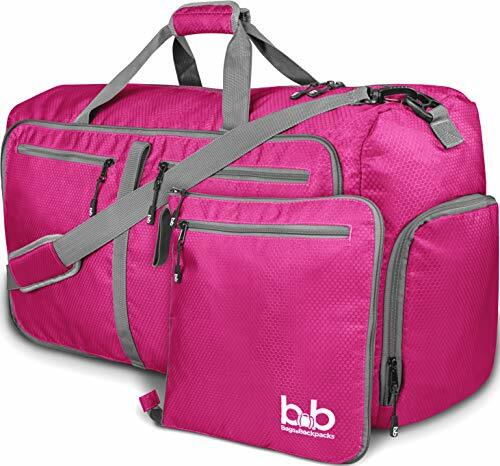 This duffle bag has a removable, padded shoulder strap, as well as padded carry handles. In addition to that, it folds into a small pouch when not in use, which is great for storage. It also has a separate shoe compartment, which also makes it a great gym bag. Sak Gear made this bag with 500-denier PVC, which is an incredibly sturdy material. That is coupled with watertight welded seams, which means that not a drop of water will be able to penetrate this bag. 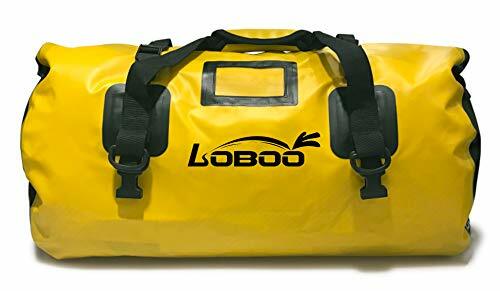 Seriously, it looks like you could use it as a life raft and the insides would still stay dry – the manufacturer, at least, claims that the bag can float without letting in any water. Anyway, it will definitely protect your things in heavy rainy, so it’s very suitable for camping or boating. You can close the bag by rolling down the top and snapping the side clips. This is somewhat less practical than just zipper closure, but it also does a better job at keeping out water. The duffel bag is equipped with padded, removable shoulder straps and carry handles that have Velcro closure. In terms of organization, there are 2 inner zippered pockets for any electronics or other small items, as well as 2 exterior zippered pockets. These aren’t fully waterproof, so be careful before you go out and test the manufacturer’s floating claim. The ripstop fabric is a tear-proof material, so you can be sure that this duffel bag is incredibly durable, and not just waterproof. 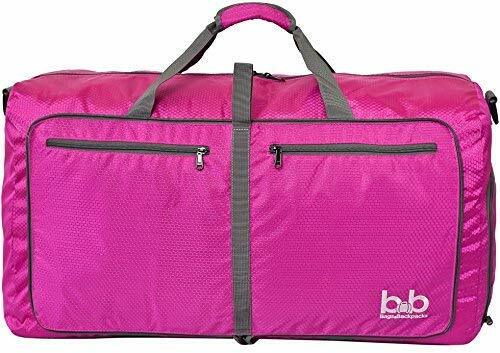 It has a zipper for closure, but the top is supposed to be rolled down and secured with 2 compression straps, so be aware that the bag will be smaller when properly closed. You can still fit a lot of items in it, and it’s a great option for wet outdoor activities. The shoulder strap is padded and removable. However, it’s not attached to the bag via a carabiner, but rather via plastic click buckles. I’m not a fan of this feature, because plastic is much more susceptible to damage than steel. Additionally, there are also reinforced haul handles that have Velcro closing, which will make carrying this bag a breeze. As for the organizational features, there is a large exterior pocket that is water resistant. There is also a smaller pocket on the inside and not much else, in terms of storage compartments. This could be a downside – all of your stuff will pretty much have to be in the same compartment, and you probably don’t want your laptop to be next to wet clothes. However, that largely depends on what you plan to put in this bag, but it’s important to know all the facts before making a purchase. This duffel bag is pricier than the previous ones, but it certainly seems worth it. It’s made of ripstop fabric and has DWR coating – a feature that we often find in some of the best waterproof jackets. That is how you can be sure of the quality of the bag! In addition to that, the bag also has welded seams, which only reinforce its waterproof quality. Apart from being incredibly durable, the bag is also very lightweight. The smaller one weight only 1.6 lbs, and the larger one a mere 2.2 lbs. This is a great thing, because these bags can get really heavy when you fully pack them. You’ll also be plenty comfortable when carrying the bag, because it comes with a removable shoulder strap. The strap can be attached to any 2 of the 6 D-rings, which is a big plus. You can adjust it however you like, and however it makes you most comfortable. For organization, there are 2 external rubberized meshed pockets that you can use to store any smaller items. Keep in mind that the pockets aren’t waterproof, so be careful when keeping electronics in them. Overall, this looks like a bag of really high quality, so I’d say that it’s worth the higher price. 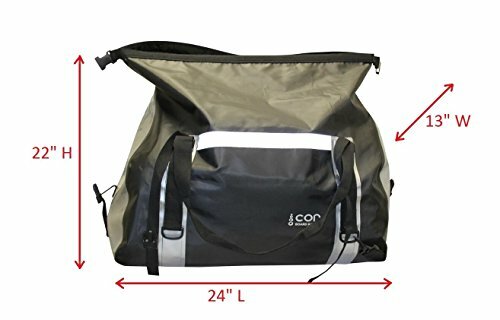 This is a great bag for those of you who are looking for a duffel bag more suited for travel than camping. The slit on the back of the bag allows you to secure it to the handles on top of your suitcase, which make it perfect for a carry on. And, the waterproof quality of the bag will keep your belongings dry and safe regardless of the weather conditions. So, if you are planning a trip and need something to keep your electronics safe from the rain, the Arxus duffle bag is an awesome choice. Another travel-friendly feature of the bag is that it folds into a small pouch. This allows for easy storage, because the folded bag takes up very little space. Additionally, the bag is designed more like a tote than a duffel bag, so it looks quite stylish. And, it’s very convenient for day-to-day use, especially in rainy weather. However, don’t expect welded seams on this duffle bag. It is a very affordable alternative, so it’s most likely not very high quality. It is really lightweight, as well as made of waterproof tear-resistant material, so it should be good enough for at least a few months. Don’t over pack it though; some reviews I read said that the seams tore under too much pressure, so be careful. But, if you are prioritizing affordability over durability, then this is the perfect option for you. 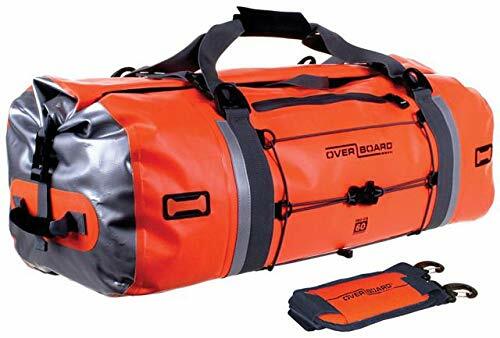 The OverBoard duffel bag is so waterproof that it can even handle quick submersion! Therefore, this is an excellent choice for you if waterproofness is your main concern. In terms of design, I have to say that this bag is nothing spectacular; it comes in 2 very bright colors that allow you to see it even in the dark, but which will also attract a lot of attention. The bag features a Fold Seal system for closure; when you want to close the bag, you roll the top and secure it with straps. There’s one exterior pocket on the duffel bag, for smaller items. Inside the bag there are several mesh pockets, but none are waterproof. So, if you want to keep any wet gear inside the bag, I would advise you to first put it in a sealed plastic bag, particularly if you are also going to put any electronics in the duffel bag. There are carry handles on the bag, and they can be closet together with a Velcro strap. Additionally, there’s also a removable, padded shoulder strap that attaches to the bag with steel hooks – a bonus. These are much sturdier than plastic buckles, and are a personal favorite of mine. 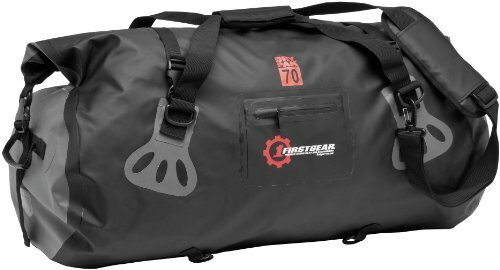 Overall, this duffel bag is a great option for anyone who engages in a lot of activities that include water – kayaking, boating or just sitting around on the beach. It could also serve you as a gym bag or a travel bag, but it is rather large, so I would recommend something smaller. This bag was designed with bikers in mind, as it has a lot of features that make it the perfect bag to attach on your motorcycle. It is made of PU leather, which is high quality material (for a bag, at least). 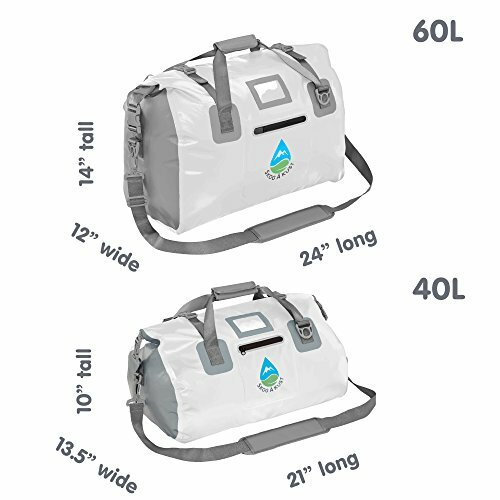 It’s 100% waterproof, and features a roll top closure. It even has an air release system that allows you to really utilize its maximum capacity. 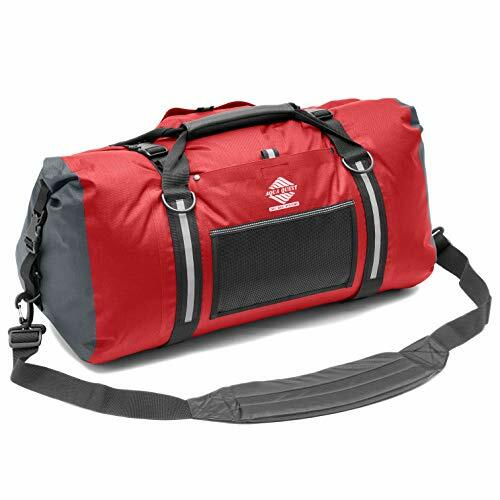 Additionally, this duffel bag is not only waterproof; it’s also hail proof, snow proof and basically weatherproof! One particular benefit of PU leather is that it is very easy to clean, especially when compared to fabrics. 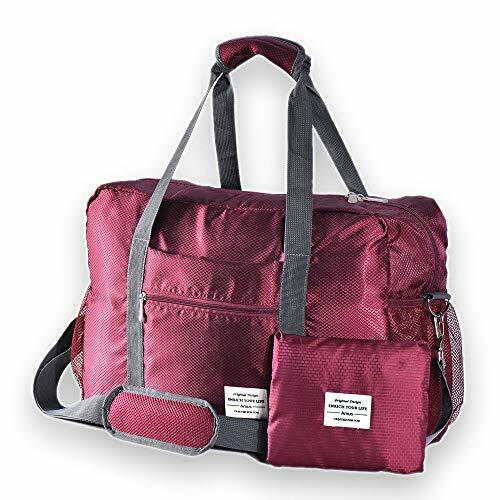 When this duffle bag gets dirty, you just wipe it off with some wet wipes, and you’re done. One thing that I don’t consider beneficial is the lack of exterior pockets on the bag. Whenever you want to get something from it, you’ll have to open it and then reseal it again, which could get annoying. The duffel bag comes with a removable shoulder strap, as well as carry handles that have Velcro closure. It also comes with 2 dismantling belts, which can handle the weight of about 200kg, so don’t be afraid to pack absolutely everything you need in it. It’s very sturdy and durable, and the only thing that I don’t like is that it’s not really suitable for an organizational freak as myself. But other than that, I’m sure it won’t let you down. As you can see, it is made of a very durable, waterproof material. It also features sonically welded sealing, which really help it keep your belongings dry in all types of weather conditions. 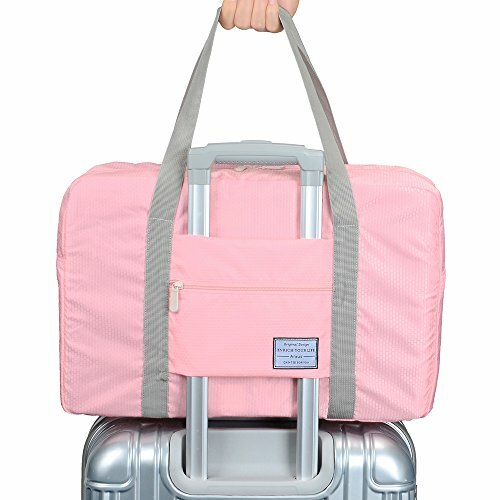 If you are looking for something sturdy and durable, I believe this is the duffel bag for you. One downside of this bag is that there is no variety when it comes to design. It comes only in the color black, with a few red and grey details. However, there is plenty of variety when it comes to size, so you can choose the one that will suit your needs best. In terms of organizational space, the bag features one zippered exterior pocket that is also waterproof. For your carrying comfort, there is a padded, removable shoulder strap. It attaches to the bag via carabiners, which won’t ever let you down. There are also Velcro-closed carry handles, if you prefer to just pick it up and carry it in your hand. 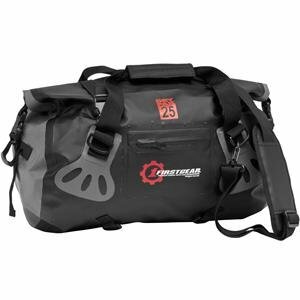 As for the motorcycle-specific design features, this duffel bag is equipped with several strategically placed D-rings that allow you to easily attach the bag to your bike. It is made of strong, waterproof material, which is very easy to clean. 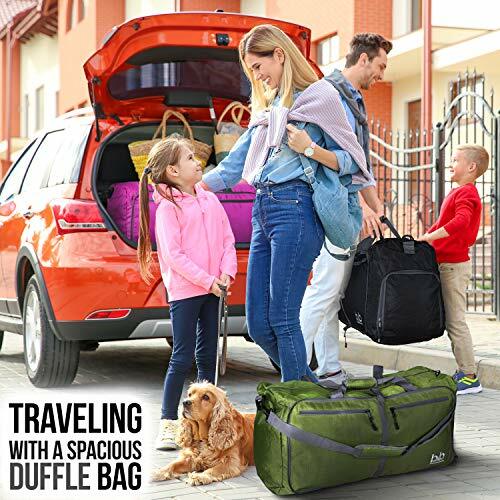 That is a big advantage, because we are looking at duffle bags that are able to handle all kinds of weather conditions. As such, they are inevitably going to get dirty, so it’s a huge relief when you can clean the bag easily. 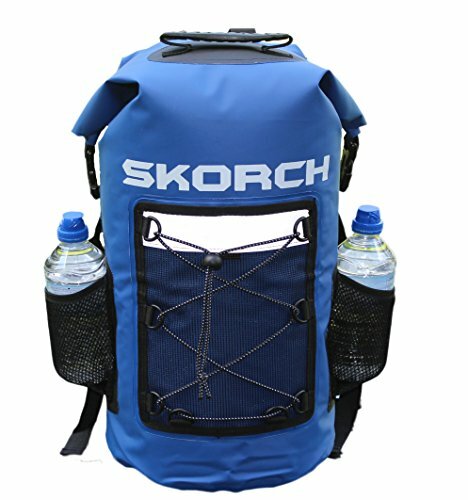 This duffel bag features 2 external mesh pockets that are designed to fit water bottles. You can, of course, use them for anything you want, but it’s great to know that water bottles will definitely fit inside them. This is a particularly beneficial feature for campers or hikers; you can have easy access to you drink, while preserving the safety and dryness of all your other belongings. 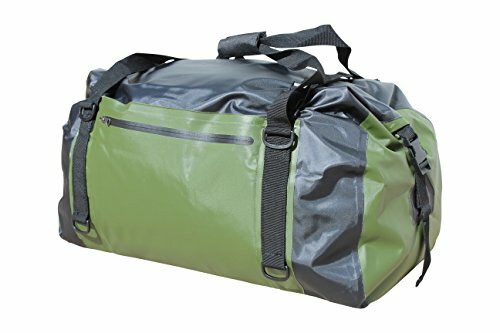 Which Waterproof Duffel Bag Is The Best One For Me? Well, I can’t really tell you which one will suit your needs best. However, I can tell you which ones I like best, and explain why. So let’s begin. 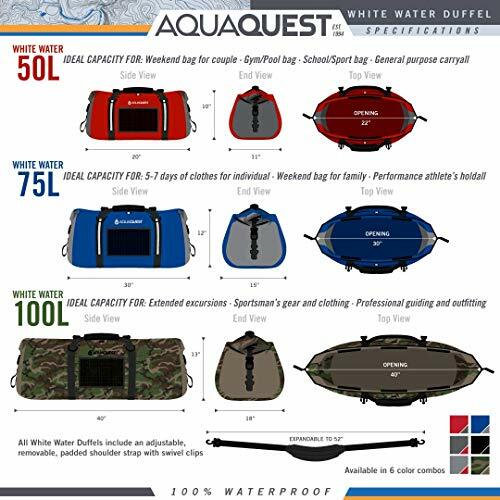 My absolute favorite bag in this review is the Aqua Quest White Water Duffel Bag. It is a high quality bag, and when it comes to dry electronics, you shouldn’t be looking to save money. A more expensive duffel bag is still cheaper than a MacBook motherboard, if you catch my drift. 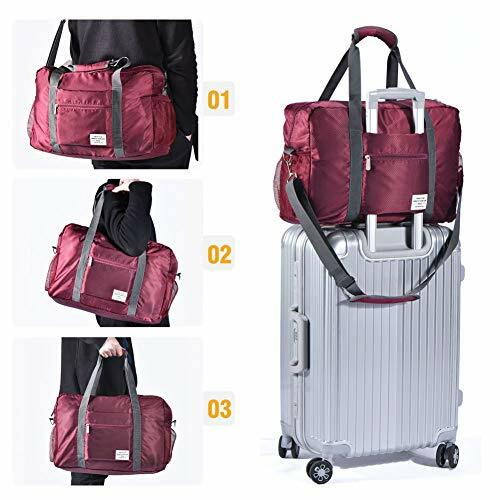 What is particularly useful about this bag is that it comes in a couple different sizes, so you can opt for the one is a better fit for you. And the thing I like the most about this bag is that the shoulder strap can be attached to several different positions. This allows everyone to choose a position that makes them the most comfortable, which is particularly beneficial for people with back pain issues. LIGHTWEIGHT + DURABLE - Weighing in at only 2.2 lbs, yet incredibly durable and long lasting, even after extended use. Abrasion resistant Oxford 420D RipStop fabric + TPU lamination + DWR coating + Double bar-tacked stress points + Welded seams = The best duffel you've ever owned! COMFORTABLE - The padded and adjustable shoulder strap easily attaches to any of the 6 D-rings on this duffel and is also removable. Alternatively, just grab the padded handle and carry it with one hand. USA SERVICE & WARRANTY: Aqua Quest is based in the Pacific Northwest, where they have designed and tested waterproof gear since 96. All products are protected by AQ's Two-Year 'No Worries Warranty'. Toll-free customer service Mon-Fri, 10-5 PST, at 1-844-775-7770. 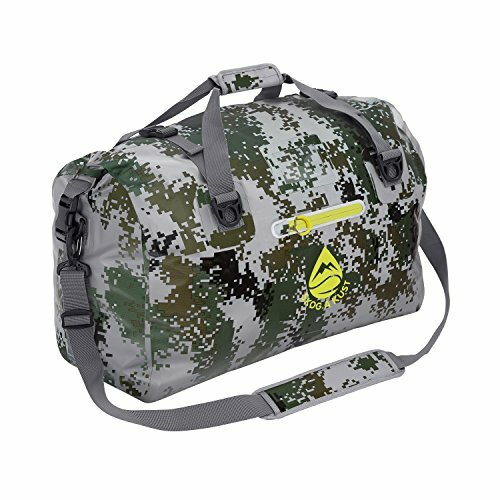 A close second is the OverBoard Waterproof Pro-Vis Duffel Bag. 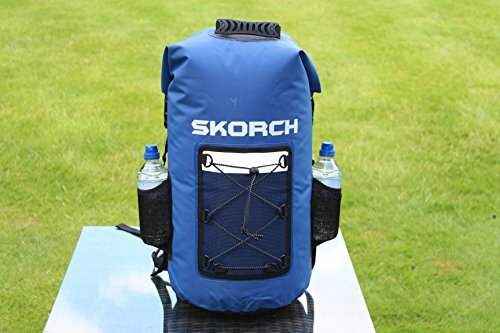 This bag was designed for travellers who were unable to find a better alternative that would allow them to carry a lot of stuff with them on sea adventures. As such, it is perfectly suitable for travellers with similar intentions. Whether you just want to lounge on the beach or take it with you in a kayak, this duffel bag will keep everything you pack in it completely safe – and you can pack A LOT in it. 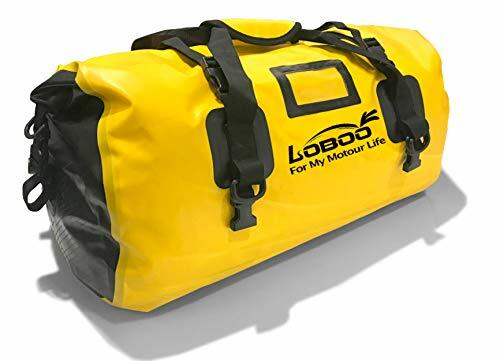 This is also the only duffel bag that can handle being quickly submerged in water without letting any water in – if that doesn’t impress you, then I don’t know what will. 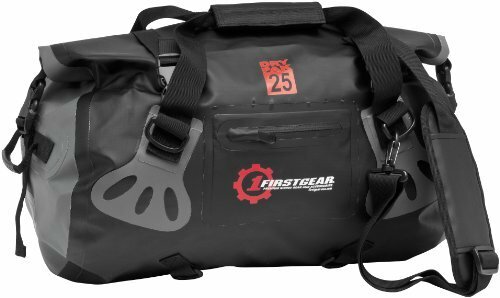 Dimensions: 26" x 12.5" x 11"
The last, but certainly not the least, is the Firstgear Torrent Waterproof Duffel Bag. I myself am not a motorcycle rider, but I have several friends who are, and they swear by this bag. That’s the only reason why I’m including it as my favorite – I don’t like the color black, and I hate the fact that it comes only in that color. But, its quality is undeniable, and quality is always far more important than design. Additionally, it is incredibly durable and it can last you for years, so you will get really good value for money. Maybe those will also be your favorites, maybe they won’t. 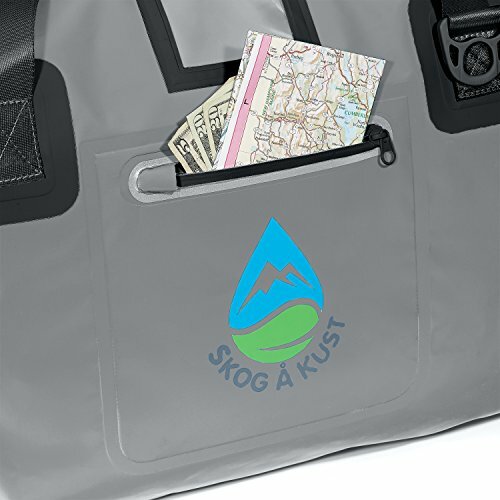 Whichever waterproof duffle bag you find appealing, be sure to check it out on Amazon. If you want to get a really good deal, that is.